booksnfilms | Books and movie reviews – English and Hindi movies. Har ik friend kameena hota hai – this is the refrain of the remade Chashme Baddoor 2013 and quite aptly so, at least in the context of the film. Now if you’ve seen the original Chashme Baddoor, you may cringe and roll your eyes at the maliyametoing the film’s director, David Dhawan has done of the original film. Yet, if you watch the movie with an open mind and a light heart, you will enjoy its silliness and loudness – a trademark of Dhawan films. The film is the story of 3 friends played by Ali Zafar, Siddharth and Divyendu Sharma, college boys with no money, lots of debt, one panga after another and generally a bindaas lifestyle. A new girl, Tapasee Pannu, comes to their neighbourhood in Goa and the story revolves around their vying for her attention and love. Drama ensues and it flits between comedy and tragedy. The dialogue is crisp, crazy and seems to be ad libbed quite often. The film moves at breakneck speed and reminds you of a Nickelodeon show (one of the partners of the film) – bright colours, loud music and exaggerated acting. The actors are no Farooque Shaikhs or Rakesh Bedis and I wasn’t expecting them to be so I wasn’t too disappointed. Rishi Kapoor and Anupam Kher are veteran actors and held their place in the film. Rishi is Joseph who falls in love with Lillette Dubey aka Josephine and they make a cute couple. Anupam Kher never fails, he is in a class of his own and is an absolute hoot. He plays Santru and Cheeku (double role. Haanji!) and everytime he appears on the screen, he has you in splits. Was it anywhere close to the original? I wouldn’t even bother comparing them because CB 1981 was in a class of its own and the star cast was subtle and polished while these are newcomers who worked really hard but the total effect was more of today’s entertainment world as we know it, loud, garish and over the top. The actors did a good job though. Pakistani actor, Ali Zafar played the sedate friend quite well, he definitely had an old man vibe around him. There were times when his style seemed to mimic Dev Anand’s. His friends played by Siddharth and Divyendu stole the show as they were energetic and fit the bill of kameena friends. Newcomer, Tapasee Pannu is cute and a natural with the girl next door look. She reminded me of Preity Zinta and it was refreshing to see an actress without a ton of makeup and a closet full of designer fashions. Anupam Kher: Lahaul vila Kuvatt. Actor: Tum kahan jaa rahe ho? Anupam: Arre kaha toh, Lahaul via Kuwait. Actor: Film main tumhe swimsuit pehnana padega? Seema: Kyun? Actor: Kyunki film doobni nahin chahiye na. A fun movie for a rainy day which will leave you in an uplifted mood when you exit the theatre. There is something about books written by foreign authors where the usual charm of a story becomes deeper with the nuances and mystique of a different land. So, as I was adding Zoe Ferraris to my list of good foreign writers, I found out that she is an American author, white as they come, married to a Saudi Arabian. That kind of lost the legitimacy of her right to write about a foreign country but when I saw that her books come from her experience of living in Saudi Arabia with her in-laws for 9 months, I had to give her another chance. When I began to read ‘City of Veils’, I wanted to devour it one big gulp because it started off with the body of a woman washed ashore in Jeddah, then it switched to Miriam Walker, an American woman travelling to S. Arabia to be with her husband who is working a security job. You can almost feel the claustrophobia of Miriam as Ferraris writes, “They were technically in New York, but she could feel Saudi Arabia draping over them with every blast of recycled air. She ran a hand through her hair and thought, Enjoy our last bit of freedom, curly locks.” Then the book moves at breakneck speed when Miriam lands in Jeddah and is thrown into a room for ‘Unclaimed Women’ because her husband is not at the airport to ‘claim’ her and as she has no work permit, she needs a man to accompany her from the airport. Eventually Eric Walker does show up and takes her home. As he leaves the house to bring some shwarma (this had my full attention, food always gets me) for her to eat, she goes up on the roof of the house. Shortly afterwards, she hears the door slam. She goes down, the food is on the table so she takes a bite then calls out to Eric. No response. She calls out again and looks in the bathroom, the other room, outside – nothing. Two hours later, no Eric. Two days later, no Eric. And this started the thrilling ride of this book. I wanted to finish it in one night while my friend who also loves to read said that she takes small bites of these kinds of books and relishes them slowly. 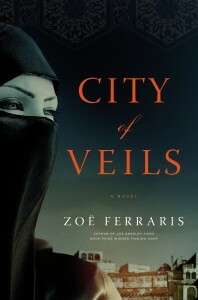 City of Veils is set in the Arab world and along with the mysteries that need to be solved (there are more than the just the two mentioned), the richness of Ferraris’ writing takes you to another world. You can smell the souk, feel the heat of the desert, the rules of not speaking to a man or being alone with him, the mutawwa – religious police who ensure women’s heads, faces and bodies are covered in public, the struggles of male characters who admire the choices of the women they love but cannot reconcile their religious upbringing with their beloveds’ independent thinking. While restrictions abound, there are scenes of sons going trousseau shopping with their mothers to buy intimate lingerie for their wives, hints of prostitution and other vices that humans succumb to easily. There is suspense, drama, murder, romance and all the other ingredients that make for a thrilling read. The vividness of Ferraris’ writing takes you right into the scene where you can almost hear the characters think and feel their thoughts. For example, there is a sandstorm towards the end of the book and the details of the storm left me breathless as I almost skipped pages to see if the characters survived the rage of the desert. And I almost forgot because now I’m just wrapped up in the story of the book but when I started to read the book, the very first sentences made my eyes pop and I was tempted to drop the book and first research the truth in the author’s statements. “The woman’s body was lying on the beach. “Eve’s tomb”, he would later come to think of it, not the actual tomb in Jeddah that was flattened in 1928, to squash out any cults attached to her name, nor the same one that was bulldozed again in 1975, to confirm the point.” What!!! I had no idea that there was an actual Eve, of Adam and Eve fame, and she has a tomb. And that is another story of legendary proportions in itself. Turn of Mind – Alice LaPlante.